Population : 1600 | there's no place like gnome. Dawson is a small town in western Minnesota, located off of Hwy. 212. If you come into town on 212, turn to the south between the Casey’s and the Dairy Queen, drive for seven blocks and that’s pretty much it. We’ve got numerical streets running north/south, trees running east west (Chesnut, Linden, Walnut, etc. ), but really not too many of either of them. Main Street (also known as 6th Street) consists of a few “for cute” shops, a hardware store, post office, grocery store, couple banks, dress shops, and a family restaurant. It’s hard to blink and miss them because the speed limit is 20 mph. “Downtown” is the happening place in Dawson until 6 pm when everything closes. Railroad tracks run straight through the middle of town, through the grain elevator and AGP, or “the bean plant,” one of the businesses which employs many people in the area. They process soybeans. (More information on AGP) It is a bit strange to drive a few blocks through a residential area and then suddenly be surrounded by railroad tracks, grain elevators on one side, a soybean processing plant on the other, and downtown just ahead. Here’s a fun Grace Lutheran Church fact I learned today: Local farmers can give their offering to the church in grain as opposed to in an envelope on Sunday mornings. When they take their grain to the elevator, they can specify that a portion of it be given to Grace and then when sold, the money comes to the church. For neat. There is a milk processing plant just outside of town (AMPI) which employs many people in Dawson and also a Cenex fertilizer plant. Lots of the people in Dawson work at one of these three agriculturally-based plants, farm, or are employed by the school district or hospital in town. Because many to most of the jobs at these places are shift based, this affects how and when we do worship, conscious that people may be working every other weekend or nights. 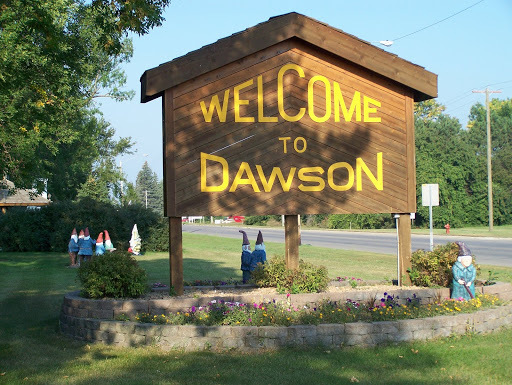 I believe the location of the three plants in Dawson is also to credit for drawing a diverse population into this rural area.